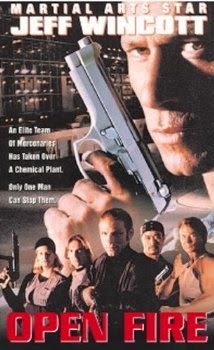 Open Fire is the last of the three movies that director Kurt Anderson and star Jeff Wincott made together in the 90’s. That run being Martial Law II: Undercover (1991), in which the genius move was made to replace Chad McQueen, from the first film, with Wincott, Martial Outlaw (1993), and Open Fire. While Anderson worked on the great Mission of Justice (1992), he did not direct it. Anderson took time out from his Wincott work in the 90’s to make the Lamas movie Bounty Tracker (1993). But when he and Wincott worked together, magic was made. Pairings like that of Anderson and Wincott made the video store era immeasurably better. You just don’t get collaborations like that today. Thanks to them and their quality output, your selection at the video store was richer, and it kept you coming back for more, thus enhancing the role of the video store in the lives of everyone everywhere. They are a part of the story of the video store in the 90’s, and they should be recognized and thanked for that. As for the plot, it’s your standard ‘DieHardInA’ movie that we’ve seen countless times before. However, just because that’s the framework, that doesn’t mean it’s a bad thing. Alec McNeil (Wincott) is a surly phone company worker who just wants to be left alone to shirtlessly pound away with his pneumatic drill with his shirt off. His father Bob (de Broux) runs Martinson Industries, some kind of chemical treatment plant in L.A. Before they can head out on a father-son bass fishing trip, a team of evil baddies storm the plant. The on-the-ground baddies are led by Roy (Shaner, also the baddie in The Expert), but the mastermind of the operation is one Stein Kruger (Kilpatrick), (not?) to be confused with Hans Gruber. If his demands aren’t met, a nerve gas goes out over the city, killing countless people. The cops and FBI are outside the building, of course, but the one thing they didn’t count on is the bravery and Martial Arts skill of McNeil. We find out he’s surly because he was a former FBI agent who lost his partner and was de-badged. Now is his time to prove he’s more than a shirtless phone company worker. The baddies are about to experience the power of McNeil-Fu at its most deadly! All the Wincott fight scenes are gold. The movie is entertaining on the whole, but those are the highlights, and they keep the entire outing afloat. There’s even the time-honored (and wonderfully unnecessary) barfight, and this is one of the better ones in recent memory. On top of the top-notch fights, Wincott’s voice is more gravelly than ever. His performance is solid - he’s a man haunted by his past, and, presumably, he’s taking his frustrations out on the baddies, with excellent effect. No Wincott movie would be complete without his use of Arnis sticks, and here he just happens to find, in the middle of a fight scene, of course, two metal pipes that are the exact length and width to be his preferred fighting sticks. Naturally, it’s all part of the fun. Open Fire is a 90’s video-store action title if there ever was one, and it lives up to the name. Even during the opening credits, there are still shots of guns interposed with the titles on the screen. Just GUNS. You cannot do that today. So while Open Fire probably stands as one of the better DieHardInA movies out there, probably its closest parallel is Lethal Tender (1997) - there it’s a water treatment plant, here it’s a chemical treatment plant. For the audience, the difference is negligible. It just provides a lot of warehouse space for Wincott to do his thing. Plus, the baddies in the movie are labeled as mercenaries. Usually in the movies we’re used to, mercenaries are the good guys (hence the Mercs box set, etc.) - so it was interesting to see mercs positioned as villains. The fact that the plot happens to be another Die Hard knockoff shouldn’t put you off - Open Fire is a qualified winner that delivers the goods you want. Also check out write-ups from our buddies, DTVC and Cool Target! Always wanted to see this one. I have, however, seen Open Fire with David Carradine. That's a good one there. I'm sold! You've got me excited to check this out! Ryan: Always wanted to see the David Carradine one. Looked insane. If I recall correctly Wincott punches someone THROUGH a jug of beer! I was expecting a cue to be broken for sticks but wasn't disappointed when later he fell against a box of sticks mid fight and had time to choose two he liked, a good fun actioner! Haha! Hmm, don't remember that part. Wincott usually delivers the goods. Mission Of Justice has some great fight scenes too.